Welcome to the LSUHSC CSI - Skills Lab. 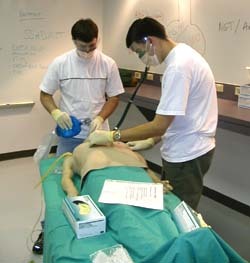 The goal of the lab is to offer students an introduction in to skills that are commonly performed in patient care scenarios. An early exposure to these procedural tasks permits the development of competency-based training. Skills that are mastered in the medical student's first year will act as building blocks for future patient care episodes. All medical students will be assessed for their ability to perform patient caring tasks and receive direct feedback on their performance. Students will be challenged and exposed to a variety of clinical skills that will enhance their ability to care for their patients. The format of the Skills Lab is fast paced and structured to assure practice and documentation of competence. Each student must attend every session well prepared and versed in the objectives for the specific training episode. Students will be expected to understand learning objectives, review detailed resources, and successfully complete a pre-test prior to each hands-on session in the lab. Preparation for these sessions is essential to offer each small group the best opportunity to develop competence. During and at the end of all sessions, the students will receive focused feedback on their performance.